In this age of instant gratification, it is not entirely surprising that the current generation has largely moved away from using slow cookers in favor of a return to the stovetop. Slow cookers are often thought of as “something my grandmother (or mom) had”, but this is one kitchen appliance that has withstood the test of time and as technology has improved, so has the modern slow cooker’s abilities. Using a slow cooker offers a variety of benefits and relatively few disadvantages – if any at all. The best slow cooker offers convenience. For most recipes, a slow cooker can be left unattended all day. Recipe ingredients can be added to the slow cooker in the morning before you leave for work and at the end of the day you come home to a fully prepared, savory meal that requires a minimal amount of cleanup afterwards. Whether you are a busy professional executive or an equally busy house spouse, a slow cooker meal is an ideal choice for a busy day. We’ve put together a comprehensive guide to everything you could possibly want to know about slow cookers – from how to use one to how to determine the best slow cooker for your home. Welcome to the wonderful world of slow cookers! Slow Cooker vs. Pressure Cooker: What's the Difference? Why Slow Cookers Are Awesome! A slow cooker is a countertop cooking appliance that is primarily used for simmering. It is a safe electrical appliance and because it maintains a relatively low cooking temperature, it can be left unattended for several hours while it cooks. A slow cooker can be used to cook certain cuts of meat, stews, soups, and a wide range of boiled dinners, including pot roast. It can also be used to prepare dips, desserts, and some beverages. In North America, slow cookers often referred to as crock pots. Crock-Pot is a trademarked name for a specific brand of slow cooker that is often used generically. The best crock pots are oval shaped or round with an glass lid. The pot itself is usually crafted from glazed porcelain or ceramic. The pot is surrounded by a housing, made from metal, that serves as the pot’s electrical heating element. The glass lid fits neatly inside of a groove that runs the perimeter of the pot’s edge. As the food cooks, vapor gathers within the groove where it creates a low pressure seal. Modern slow cookers will usually have a minimum of two heat settings and occasionally will have a “keep warm” feature. The most advanced models boast continuously variable power; however, the majority of slow cookers do not offer temperature control. Instead, the unit delivers a constant, continuous heat to the food it is cooking. The food’s temperature will rise until it reaches the boiling point then, the sloping glass lid helps to direct the steam from the gently simmering food back down towards the surface to thoroughly cook the entire meal. Slow cookers are available in a wide range of sizes – from 16 ounces to 7 or 8 quarts. There is also a new breed of programmable rice cookers that can serve double duty as slow cookers. The beauty of using a crock pot or slow cooker is that it is simple. Prepare your ingredients, add them to your slow cooker, and press the Start button. However, there is a difference between a good meal prepared in your slow cooker and an excellent one. Here are 4 tips to bear in mind as you learn how to use your slow cooker. As mentioned, slow cookers are available in a wide range of sizes. It is important to ensure that you are using the size recommended by the recipe you are preparing. Doing so ensures that you do not under-fill or overflow your cooker, and it helps ensure that your meal will cook properly. In general, most (but not all) slow cooker recipes are designed for a 5 to 6 quart model. 2. Don’t overfill your slow cooker. To ensure that the meal you are preparing is finished within the timeframe listed on the recipe, take care to make sure that you do not overfill your slow cooker. Overfilling your slow cooker could potentially lead to a number of food-safety hazards. Although most manufacturers will instruct you to never fill your slow cooker more than two-thirds of the way full recommendations vary between brands so make sure to consult your model’s instruction manual. 3. Keep the lid on! With the delicious smells wafting through your kitchen, we can certainly understand why it is tempting to take the lid off of your slow cooker and take a peek at the meal it’s preparing. However, taking the lid off of your cooker significantly slows down the cooking process because it allows heat to escape. Ideally, the lid should only be removed around 30 minutes before the end of cooking time in order to check its doneness. 4. Always keep an eye on the temperature. 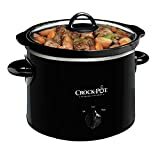 The best crock pot is definitely simple to use and convenient; however, if it is not used properly, there is always a risk of food-safety hazards developing. Bacteria thrives in the danger zone between 40 degrees to 140 degrees Fahrenheit. Precautions must be taken to ensure that the ingredients inside your slow cooker are not allowed to remain in the danger zone for too long. There are a few things you can do to avoid the danger zone. For example, you should never add frozen ingredients to your cooker. Similarly, any ingredients you’ve prepared ahead of time should be refrigerated and stored in separate containers, and you should never attempt to cook an entire roast or chicken in your slow cooker. Meat that you plan to cook in your slow cooker should always be cut into small chunks to ensure that it cooks evenly throughout. We’ve already talked about how convenient slow cookers are, but this is only one of many benefits that slow cookers have to offer. For example, did you know that, because meats and vegetables are cooked at a low temperature for a long period of time, they retain more of their natural vitamins and nutrients? Read on to find out more about the amazing advantages these appliances have to offer! You save time! You don’t have to spend hours of your day preparing delicious meals. All the work that is required from you is the initial preparation of ingredients. While your slow cooker is doing all of the work, you are free to devote the hours in your day to other tasks. Slow cookers can be used year round. Most people associate slow cooked meals with autumn and winter, but they can be used any time of year. One of the biggest benefits of using them during the summertime is the fact that they eliminate the need to spend hours standing in front of a hot stove and making your hot home even hotter. It reduces your energy consumption. The best rated slow cookers consume a fraction of the amount of energy required to operate a traditional electrical oven. Clean up is an absolute breeze. In addition to the slow cooker pot, at the most, all you’ll be required to clean is your prep utensils, a cutting board, and one or two pans that you used for browning. If you’re like us, at the end of a long day, the last thing you want to do is hover over sink scrubbing dishes. Slow cookers are transportable. In most cases, you won’t even have to remove the meal from your cooker. Simply keep the lid on it and allow it to cool a bit before moving it. A quick Internet search reveals that there are dozens, if not hundreds, of different slow cooker models to choose from. With the diverse array of features and sizes that are available, choosing the perfect slow cooker for your kitchen can be a bit complicated, so how do you know which one is right for you, your family, and your kitchen? The first variable to consider before buying a new slow cooker is its size. For a single person or a family of two, a 2 or 3 quart slow cooker will be sufficient. If you will be regularly cooking for three to four people, a 4 quart slow cooker is ideal. Families of four to six will need a slow cooker with a minimum capacity of 6 quarts. Experts recommend purchasing several slow cookers of varying sizes, but for those who cannot, 5 to 6 quart models are considered the most versatile. Slow cookers come in two different shapes: round and oval. Round slow cookers are ideal for cooking stews, soups, and chili. However, slow cookers with an oval shape have more more surface area, which provides more space for adding food. Because there is more surface area, oval shaped slow cookers tend to have slightly faster cooking times than their round counterparts. Of the two options, manual slow cookers are more affordable. They generally feature a knob or button with three to four settings: Off, Low, High, and Keep Warm. The best programmable slow cooker affords the chef more control. A specific cooking time can be set, and when the cooking time is complete, the slow cooker will automatically switch itself over to “Keep Warm”. This is a helpful feature to have if you plan on being away from home for long periods of time. The primary downside to having a crock pot with a timer is that, should your home’s power go out, the digital timer will reset itself, and you may come home to uncooked food. A warning here though, the ‘keep warm’ feature available on some slow cookers can possibly allow the internal temperature of your meal to fall back into the danger zone mentioned earlier. Leaving your pot of chili on the keep warm feature all day, so that your family can help themselves when they are hungry, is probably not a good idea. Before buying a new slow cooker, you need to decide what additional features you would like it to have. For example, see-through lids are best, because they allow you to view your food as it cooks without having to lift the lid. Likewise, newer slow cooker models now feature a locking lid, which is handy to have if you will be regularly transporting your slow cooker. Just keep in mind that additional features like these will raise the price of the model you choose. Perhaps the single most effective action you can take to help yourself find the right slow cooker is to read both professional and consumer written slow cooker reviews. 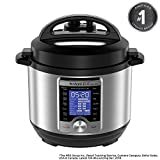 These crock pot reviews contain invaluable information regarding the experiences others have had with slow cookers, and these reviews will often be the tipping point in deciding whether you want to purchase a specific model or not. With slow cookers, slow and steady wins the race. While they take a significant amount of time to prepare dishes, they are simpler to use and more convenient than pressure cookers. Low slow cooker temperatures are used to allow the ingredients to simmer throughout the day, which ensures that they are cooked evenly. If you do not like to be actively involved in the kitchen, then a slow cooker is ideal for you. Slow cookers can be simply turned on and left unattended for hours on end. Pressure cookers are quick and powerful. While a slow cooker requires hours to prepare a single dish, a pressure cooker can cook the same dish in a matter of minutes. Pressure cookers employ steam to quickly cook and heat foods. The machine seals the ingredients inside, and as the steam and high amounts of pressure begin to accumulate, it flash cooks the food. Because solids and liquids combine easily within the highly pressurized environment, it is ideal for quickly cooking foods. On the other hand, this appliance is best used by those who have a considerable amount of experience cooking since the lid cannot be removed to check its progress as it cooks. If you are looking for an enjoyable method of making affordable and healthy meals for your family, then a slow cooker is the way to go! First of all, there is the fun nostalgia factor. Many of our mothers and grandmothers owned slow cookers during their day, and preparing meals with these enduring appliances often brings back fond memories of childhood. Alternately, it also lets you create new memories with your own family. We’ve talked about how slow cookers are inexpensive, simple to use, easy to clean up, and make tasty meals, but what most people don’t know is that the meals you create in your new slow cooker will be much healthier and more nutritious for your family. For example, slow cooked meals rarely call for added fats or oils because time and liquid are what cook the food. Slow cooked meals generally have a significantly lower fat content than fried foods or the offerings of a restaurant and because of the cooking method used, meats and vegetables prepared inside of a slow cooker will retain more of their vitamins and nutrients than those cooked in a traditional electric oven. Slow cookers are inexpensive (for base models), cost very little to operate, and can transform low cost vegetarian dishes or cheap cuts of meat into something savory with the single flip of a switch. Although price points vary, most slow cookers have a purchase price that is well under $100.00. When compared to the cost of countertop broilers and convection ovens, the price becomes even more affordable. Slow cookers can reduce the weekly and monthly cost of your grocery bill by enabling you to purchase cheaper cuts of meat and use low heat to tenderize them for longer periods of time (e.g. overnight). Your slow cooker can transform these cuts of meat into savory stews and soups. Slow cookers are also useful for preparing a variety of vegetables. For example, if you used your slow cooker to soak and cook dried beans, this would cost you less than 30% of the price of purchasing canned beans in a store. Of course, there is also the considerable amount of money that you can save by taking the leftovers of your slow cooker meals into work as lunch or reworking them into another meal for your family. With all that slow cookers have to offer, perhaps the most important reason why you should consider investing in a slow cooker is the fact that, along with money, it is going to save you a significant amount of time since the slow cooker does most of the work. After your ingredients have been prepped and added to your slow cooker, there is no need for you to hover – monitoring and stirring it. Since you are not using an oven, there is no burning or boiling over to contend with. You do not have to babysit your food as it is cooking. Many people are unaware of the amount of time using a slow cooker can save. Busy Moms agree, when it comes down to going outside to play with your kids or staying indoors to cook supper, having a slow cooker makes the decision much easier. 1. What size slow cooker should I buy? The most important decision you will make when purchasing a new slow cooker is determining which size to buy. Slow cookers are available in a wide range of sizes – from 2 quarts (mini slow cooker) to 8.5 quarts (large slow cooker). A slow cooker with a one to three quart capacity is generally sufficient for one to three people. Families with three to five members will want to upgrade to a model with a four to six quart capacity. Eight quart models are reserved for cooking for five to seven people. However, if you want to have the ability to cook sizable pieces of meat, then you will need to invest in a slow cooker that has a minimum six quart capacity. A handful of slow cookers are accompanied by three differently sized crocks, so you can choose the exact size you need when you are cooking a dish. Because slow cookers must be kept at least half full, you will need to give careful consideration to which size you need before making a purchase. 1. What temperature is high on a slow cooker? The answer will vary from one slow cooker to another, and you should consult the owner’s manual for an exact answer. However, in general, the high setting on a slow cooker will reach 250 degrees Fahrenheit at its hottest point. 2. How do slow cookers work? Essentially, a slow cooker is an electric pot that has a stoneware insert. Unlike a stovetop or conventional oven, a slow cooker will cook food at a consistent temperature for up to 12 hours. When the lid is placed on the stoneware insert, it traps heat inside the container, which is what cooks the food. This is why it is important to resist the temptation to remove your slow cooker’s lid. Each time the lid is lifted, heat escapes, and it prolongs the cooking time that is required. 3. What is the largest slow cooker size? Slow cookers are available in a wide range of sizes. 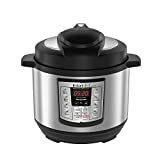 The smallest model of slow cooker on the market today has a two quart capacity, while the largest model made for use in private kitchens has an eighteen quart capacity. There are 22 quart slow cooker models available for purchase, but these are generally reserved for use in commercial kitchens. The most popular slow cooker models have a 6 to 7 quart capacity. 4. Are slow cookers dishwasher safe? The metal housing of a slow cooker should only be cleaned by hand, and it should never be submerged completely in water. It should be wiped down, by hand, with a damp cloth. However, once the slow cooker’s pot has cooled down, it can be washed in your dishwasher; although many manufacturers recommend washing these pots by hand as well in order to preserve their ceramic coating. Be sure to check the manufacturer’s recommendations on how to clean your slow cooker.